Thank you for your patience as we sort out our options and work to develop an action plan going forward. 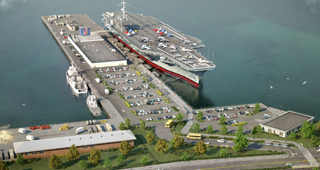 A rendering of the USS JFK at her new home (TBD). It stands to reason that if we can identify an appropriate mooring site on property not owned by the Navy, we will be in a strong position to argue for the return of JFK to donation status. We still have a couple of cards to play, and until we have exhausted ALL our options we want to hold back from any massive email or letter-writing campaign. When and if we do launch a public appeal to top Navy leadership and our representatives in Congress, it must be positive. The last thing we want to do is alienate the very people who have the power to give us what we want. At the appropriate time we will provide talking points to help you craft those messages. There are two separate (but very related) issues in play here, and two different commands within the Navy dealing with those issues. Naval Sea Systems Command (NAVSEA) controls the disposition of the ship, while Naval Facilities Command (NAVFAC) controls the real estate—and the piers. The way we read the tea leaves, NAVFAC’s decision not to allow us access to Pier 2 in Coddington Cove causes NAVSEA to believe we don’t have a site to berth the ship—thus the potential move toward scrapping JFK. It stands to reason that if we can identify an appropriate mooring site on property not owned by the Navy, we will be in a strong position to argue for the return of JFK to donation status. We need 60 days to review those alternatives. The engineering analysis involved will cost money, so we are setting up a separate fund just to cover those expenses. If everyone on this page were to donate $50 to this year-end appeal, we would be well-positioned to do the work necessary to justify a reconsideration by the Navy. Please consider a year-end tax-deductible contribution to the Engineering Fund. In the meantime, we are working tirelessly to locate another mooring spot for “Big John”. We have come this far, we are not giving up now! 23 Responses to "The Current Situation, The Next Steps, How You Can Help (Now)"
I served in 1 Main Machinery Room aboard USS John F Kennedy. I chose my duty station, turned down a billet on USS Enterprize to be there. I loved operating & maintaining the main engines and generator systems. There wasn’t a void, compartment, or space I didn’t get to know through our shipyard overhaul. It was fantastic to watch sunsets and sunrises at sea. Feeling the living rhythm & vibrations of the ship 24/7 becomes a permanent part of you. 30 years later, I still wake up from vivid dreams of walking around the decks, feeling the hum vibrate through my boondockers up my body, part of my whole being. I hope to still be able to show my kids & grandkids around Big John. Texas City Dyke or Galveston Island would be a perfect final anchorage for the USS John F Kennedy Air/Sea Museum! Has Boston Harbor right along side the JFK Library ever been considered? Namesake Carrier and Presidential Library together. I previously served on the USS Forrestal CV-59. I am from Boston Ma. I was saddened when my ship was scrapped as many of the men whom served on her. In think Boston would be a great choice considering the Kennedy’s are from Massachusetts. I think we can deal with the weather and adapt to it. Boston is a big tourist attraction for many people from all over the world. Served aboard “Big John” twice with Air Wing. Loved every minute of it. Now retired, I often reflect on those days. Have wondered for years what ever happened to Big John. As a very young child (toddler), I was completely mesmerized by President John F. Kennedy, the mere sound of his voice instantly drew my undivided attention. I could go on and on. Have always personally felt / hoped CV-67 would be moored adjacent to the JFK Library in Boston. But admittedly I have no idea of the logistics issues etc. etc. involved to do so. Stumbled onto this website and initially was very pleased. That is until I read further, “News” update; Sad News. I sincerely hope this endeavor comes to fruition. As a Navy “brat”, once lived in Rhode Island (Dad stationed at Quonset Point) and loved it! I have always wanted to go back. With the Big John as a museum piece in RI, I would be very motivated and have no excuse not to return! I was a ship’s company corpsman on board The Big John from 1980-1981. she was by far the best command I served during my time in the Navy. I certainly hope that she becomes a museum, it would be a big shame if she doesn’t. Am interested in knowing where the ship is now,and if it can be visited.my husband was part of the first crew when it was commissioned. He is now deceased.my sons and I want to walk the engine room floors where he worked. The USS JFK is currently located at the Navy’s inactive shipyard in Philadelphia, PA. Though no one is allowed on board, I believe it is visible from public areas. I previously served aboard the U.S.S. Saratoga. I was a plank owner on the J.F.K.. I joined her in the pre-commissioning unit at Norfolk Naval Base in June of 1968. I was an illustrator draftsman (E-3 striker) assigned to the new Management Control Information Center. I wa. s proud and honored to be part of a brand new aircraft carrier and a brand new Naval program. I would hate to see this ship sold for scrap and end up like the “Sara”. The J.F.K. should become a museum as intended. If not in Rhode Island then maybe Norfolk located alongside another great ship, the U.S.S. Wisconsin BB-64. What could be more appropriate than to bring the J.F.K. back to the place and area where she was given birth and was first home ported. She was the first and last of her class and MUST BE SAVED. I served on JFK from ’78 to ’80 while assigned to HS-11 Dragonslayers. I have many, many fond memories my time on Big John. It would be a genuine shame for this repeated Gold Anchor winner to be scrapped. I was onboard the JFK from 1997-2000 as a Machinist Mate petty officer. I worked as the only female amist the 40 plus guys I served with. Nothing would give me more pleasure than seeing the JFK turned into a museum where I can take my two boys and show them where their mom worked hard for three years. That JFK can’t use that pier…. I was really hoping that She…. I really do hope it will work out somehow…. Big John was my home from 1968 – 1972. I was in P-1 division and worked in 4MMR. I agree that a southern port would be a better location. I always thought the perfect fit would be the Kennedy Space Center. There is an established tourist base and the addition of a carrier museum bearing the Kennedy name would be the most logical choice provided there is ample space to fit such a large ship. Hey sangiovanni ran across your name on trying to save jfk 67 its been a long time glad your alive and i hope well.thanks for taken me to your uncles for xmas in 71 and72 send me a gmail.just to give you a heads up my son is a stand up comedian and lives in brooklyn look him up his name is jeff scheen l hope to here from you . As a New Englander I of course prefer any path that sees the JFK remaining in New England. Is Battleship Cove a possibility? Berthing the JFK in its namesake’s home state certainly sees desirable to me. Is there anywhere in Boston? Quincy? Portsmouth? Hyannis? I’m sure you’re looking at all this; keep up the good work! I too was ship’s company(76-79). Admiral Tuttle was my last Commanding Officer. I grew up with an admiration for Lt. Kennedy add so was proud of my assignment to the USS John F. Kennedy, and greatly regret leaving the Navy…and Big John. I now live back in Pensacola, Fl, the home of naval aviation, where the USS Lexington USED to be based as a training carrier, and the channel was dredged in order to acommadate a deeper draft carrier for training purposes upon the Lexington’s decommissioning…which we never received. Training has since been moved to Corpus Cristi and so the Lexington’s bearth lies unused. Where I would be MORE than proud to once again “serve” aboard her, as a volunteer…on weekend’s of course, since I still work a full time job. Just saying. I am a Plank Owner of JFK (1967-70) and served in the CS Division. I was on the bridge for her commissioning tasked with launching the U.S. flag (ensign). I’ll never forget the sight of the Blue Angels.soring overhead immediately, thereafter. Having the joy of sailing her down the James River and on to GITMO for her first time and on to the Med was a memorable experience. I think Joe Chmelik’s idea of a southern port makes a LOT of sense. I visited the USS Midway last May (2017) and was highly impressed with the success of that program and the number of volunteers, many “former” Navy pilots, and others that made that visit so smooth. The habitual inclement weather in New England would probably be very detrimental to any “above deck” displays and exhibits that are the hallmark of the Midway. I will make a (good-faith) contribution to the Engineering Fund in hopes that you are able to find a suitable/acceptable permanent mooring for JFK. bad somewhere in Georgia or Florida isn’t available. I currently live in Virginia (yeah, didn’t think that would happen either) but i’d would travel to the NE or SE to visit my old ship!